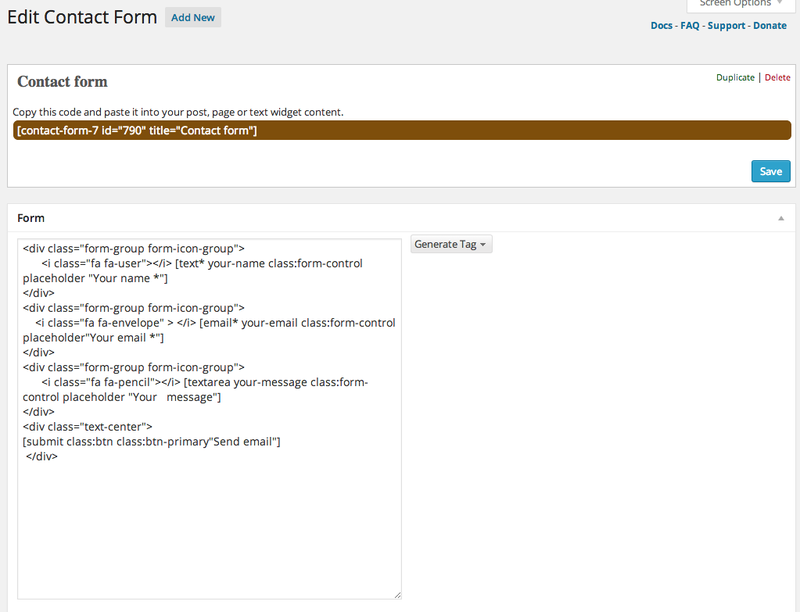 A contact page in Omega requires the Contact Form 7 plugin to be activated, in order to be able to create a contact form. Make sure you have downloaded and installed the correct plugin from here. The Contact menu option on the left is where you add contact forms. To add a new contact form, select the Contact > Add New option from the left hand WordPress menu. From the next screen press the blue Add New button if you want to use the default English language, or choose one from the dropdown menu and press the Add New button next to it. When you get to the next page, paste the following code into the Form field, after you have set a name for the contact form in the Untitled field. For the next options, in the Mail panel, fill the To: field with the email account that you want the emails to be redirected to. Every time the contact form gets filled by a user and sent, this email account will be receiving an email according to the format defined in the Mail panel. For the rest of the fields, you can leave the default values. Now press Save. As you can see in the image below, you should now have a shortcode to paste in your page's content, which will add the contact form you just created.